In this review of the Yamaha DXR10 we are going to covering 5 important areas which include key features, what we like, pros and cons, who is this product best suited to and what customers who have bought the speaker are saying about it. 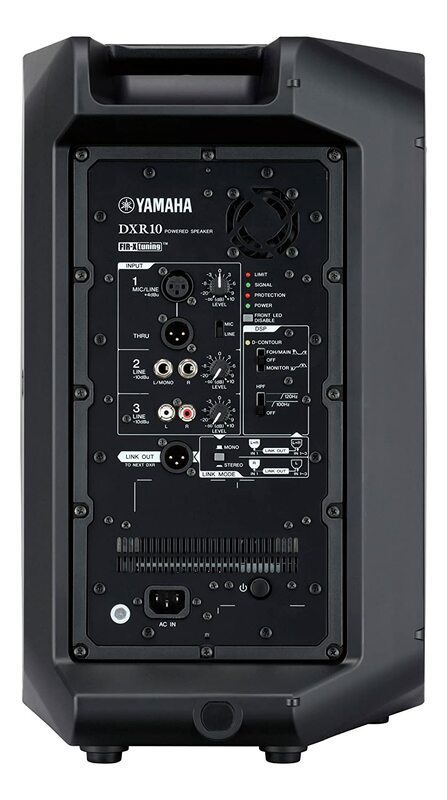 Digital Signal Processing – The products in the Yamaha DXR 10 series have the same digital signal processing (DSP) technology as Yamaha’s DSR series. DSP monitors the output of multiple frequency bands and calculates the best EQ adjustments to deliver a high sound pressure level of up to 133db and an output power of up to 1,100 — without losing its high sound quality. Protection Circuitry – Because of the DXR10’s high performance levels, it features top-of-the-range protection circuitry to ensure consistent power and sound quality delivery without fail. The speaker’s protection circuitry includes DSP control components that protect the speaker’s transducer, power amplifier, and the power supply. There is also a limiter activity LED light that is fitted to the front of the speaker and that indicates when the limiter is in use. Link-out System – The fitted link-out system allows you to expand your configuration by adding another product from the DXR series or any other active loudspeaker; the Mackie Thump15, for example. This feature also allows you to choose between a mono or stereo configuration. Compact and Lightweight – One of the things we like best about this versatile active speaker is the fact that, despite being compact and lightweight, it still manages to deliver superior output power and sound quality. Most loudspeakers in this price range with compact speaker enclosures that are operating at high output levels will typically produce a lower audio quality. With this high-end loudspeaker from Yamaha, this is not the case. Use in Combination with Subwoofers – If you regularly use a combination of full-range loudspeakers and subwoofers, this model’s high-pass filter may be of interest to you. The high-pass filter allows for use with a subwoofer and offers a frequency filter selection between 120Hz and 100Hz. You can easily use this model with the 15” DXS15 or the 12” DXS12 subwoofers for additional low-frequency reinforcement. Setting the DXS10 up in a three-way PA system is incredibly easy, as you can link the speaker to your mixing desk via the subwoofer’s XLR input and output. Versatility – The versatile ABS cabinet supports all sound reinforcement applications. The speakers can be mounted on stands and subwoofers, or you can use it as a floor wedge. The enclosure also has rigging points for suspended installations. Because of this unit’s versatile design, the Yamaha DXR10 is suitable for use in a wide range of applications. 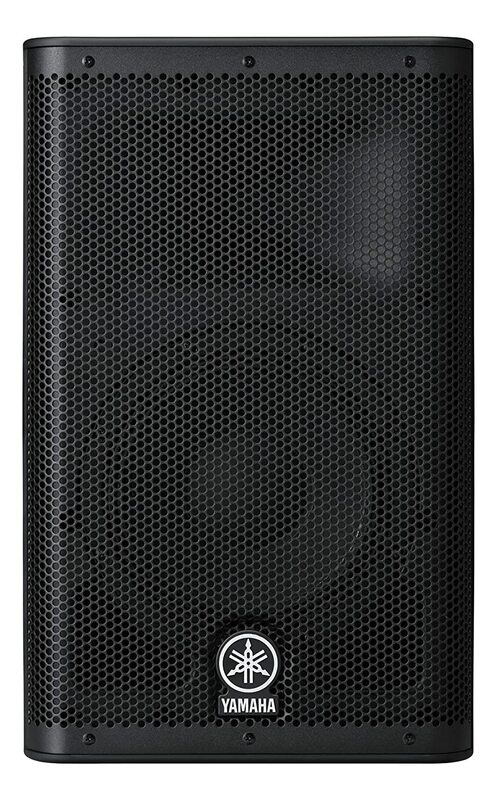 Solo artists, venue managers, or wedding DJs can use this speaker for front of house sound reinforcement and playback. 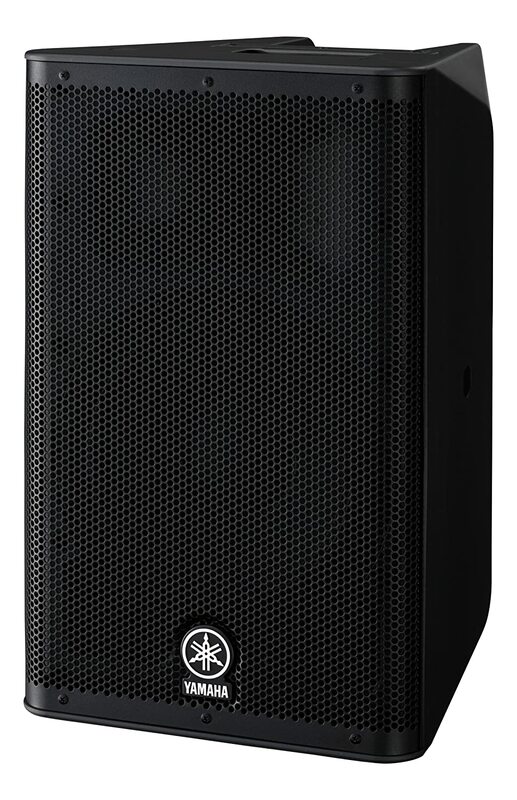 Despite its compact size, this little Yamaha speaker packs a punch and will get the job done in larger venues as well. Bands, artists, and event managers can use the unit as a monitor speaker. Since it has a 50-degree dispersion angle, it won’t blast the sound waves into the performer’s knees, but rather to their ears. The speaker can also be effortlessly incorporated as part of an array. Sound Quality – Naturally, the thing that customers like most about this unit is its warm, clear sound quality, even at the highest volume before the limiter light comes on. High-quality Compact Enclosure – The ABS cabinet is strong and durable. It also has a sturdy metal grill to protect the transducers during storage, transportation, setup, and use. Onboard Mixer – Another aspect of this speaker that customers love is the onboard mixer, as it eliminates the need to accommodate a mixing desk. Instrumentalists especially like this feature as it allows for a clean and quick setup. 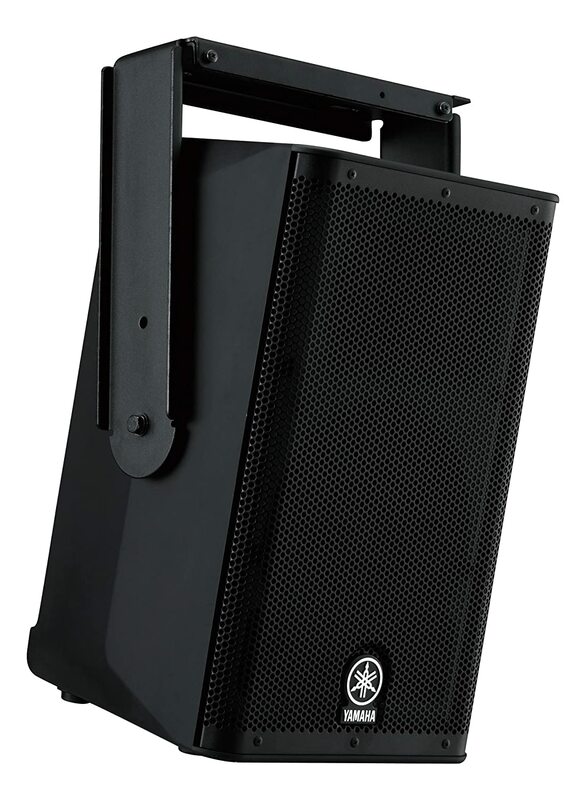 Loud for a 10” Speaker – Small event DJs that purchased a pair of these loudspeakers could use them in any reasonably-sized venue without any problems relating to volume. Not an Attractive Speaker – Some customers said that, although this speaker delivers a high audio quality, it doesn’t do its environment any favors when it comes to aesthetic appeal. The Yamaha DXR10 is a full-range, two-way active loudspeaker from one of the world’s leading manufacturers. It features high-end digital signal processing, protective circuitry, and a handy onboard mixer. One of this model’s best attributes is its wide application range. It is compact, lightweight, and can easily be incorporated into an array or larger configuration. Despite being on the small side, it delivers a high audio pressure level as well as a clean sound. There is a lot to love about this loudspeaker. If you’re looking for an all-around, high-quality product that you can use in all your sound reinforcement and playback operations, the DXR10 is definitely worth considering.